The Norman Ng Building in Karangahape Road has undergone a refit. For decades last century it was a fruit and vege shop. I knew it as the Brazil restaurant in the 1990s, then it was a hamburger place -- and now Theatre Cafe. The refit is wonderful -- the arched ceiling is revealed inside once more and outside is in the process of being done up as well. Then, I noticed something behind all the scaffolding. This would be the point where anyone accompanying me at the time would see me gape, then point with shaking finger, "See that? See it? That's an old Fuller's Cinemas sign!" This narrow little building started out in 1925-1926 as the Karangahape Entrance for the Prince Edward Cinema in Pitt Street south, around the corner (the cinema proper became known as the Mercury Theatre, and the street as Mercury Lane). According to Jan Grefstad in his unpublished Auckland Cinemas (2002), John Fuller & Sons opened the original King's Theatre in 1910. Ben and John Fuller continued to operate the cinema from 1922. In 1926, and American showman named Bud Atkinson "looked at the King's Theatre and diagnosed why it was not doing spectacular business; it had no entrance on Karangahape Road. Plans were prepared by April for an elaborate. marble-tiled entrance, a long corridor opening into a lounge foyer." The cinema became the Playhouse from 1948, which was closed by Kerridge in December 1967 and completely altered to become the Mercury Theatre in 1968. 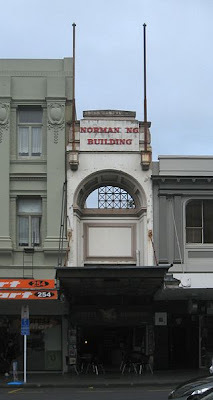 The Karangahape Road entrance was sold off as separate title and became the Norman Ng fruit shop According to historian Helen Wong, the shop was "said to be the only fruit shop with a marble floor." The fruit shop closed in the early 1990s. "Wing Kee "MOTTO" SMALL PROFIT BIG TURNOVER means MORE FRUIT for your MONEY". I thought it was quite funny so I snapped it; There was a period that I took a lot of photos of old street signs around New Lynn, Point Chev, Avondale, Grey Lynn and the CBD because the logos and graphics interested me but I knew were not appreciated by that many others. It was a period when great tracts of the city were being razed. I am glad I did now, I can't think of anything that remains when I look at the images. Thanks for letting me know about your site in your other comment today. I'll add it as a link from here. If ever you post any of your images for Avondale, New Lynn and Pt Chev, could you let me know? (I'll try to sign up to follow your blog in a tick as well) I'd link back to your posts. And good on you for being another one capturing our transitory urban landscape before things inevitably change. I also have a connection to the Mercury Theatre as my father owned it from 1992. I don't really know what the details of that arrangement were except he seemed to have been surprisingly hands-on. I have submitted a few sign photos to this great blog: http://www.preserve.co.nz/ so they may be posted sooner or later. Great post! I remember the Norman Ng building as a fruit shop when I lived in Pitt St in early 1993 and the man, possibly Norman selling his fruit out of that skinny alleyway of a shop. I often wondered why such a narrow building was worth building, now I know. Thanks! Speaking of Mercury connections, in about 1997/8 my band played a show at a birthday party in the upstairs bar of the theatre building. I noticed that inside the old lift, the inspection/registration plaque listed the address as 3(-ish) France St. My first clue that these streets once went right across the Newton Gully before the motorway went in. Cheers for that, Ash. The Fullers sign has been left alone, I see.